Runs continued to be plundered at Cardiff, with Northamptonshire losing only four wickets on the day and scoring 288 runs in the bargain. That meant they closed in on Glamorgan’s massive total of 570/8, needing only 48 more to overtake the hosts. Having already notched up his hundred the previous day, Ricardo Vasconcelos amassed 184, while his opening partner Rob Newton hit 105. The pair put on 303 runs for the opening wicket. 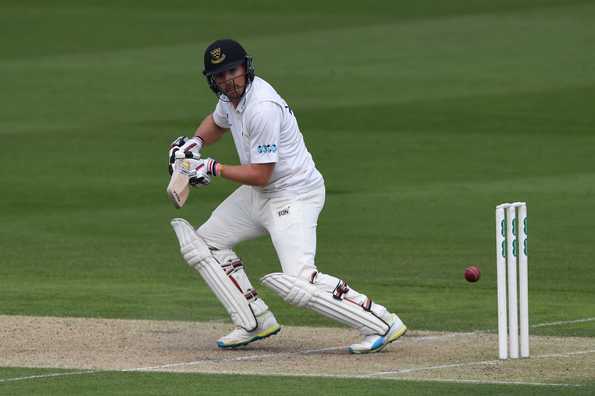 Alex Wakely, the captain, was the only batsman to endure a bad outing as he was dismissed for 18. Joshua Cobb and Rob Keogh, however, hit fifties as Northamptonshire finished the day on a high. Brief Scores: Glamorgan 570/8 decl (Billy Root 126, Marnus Labuschagne 121, Kiran Carlson 111; Jason Holder 2-79) vs Northamptonshire 522/4 (Ricardo Vasconcelos 184, Rob Newton 105). A fighting 98 by Gareth Roderick and a fine 74 from Ryan Higgins helped Gloucestershire take higher ground against Derbyshire. Resuming the day at 202/5, Higgins and Roderick enjoyed a 119-run stand to put Gloucestershire in control. Ravi Rampaul and Logan van Beek then combined to strike at the end to bowl out Gloucestershire for 350, which came with a handy lead of 59 runs. In reply, Derbyshire lost two early wickets to reach 18/2. However, Wayne Madsen and Tom Lace shared an unbeaten 79-run stand to take Derbyshire to 97/2 at Stumps. Brief Scores: Derbyshire 291 and 97/2 (Tom Lace 48, Ryan Higgins 1-14) lead Gloucestershire 350 (Gareth Roderick 98, Ryan Higgins 74, Luis Reece 3-59) by 38 runs. Worcestershire asserted their dominance over hosts Leicestershire by enforcing the follow on after bowling them out for 302. Josh Tongue was the pick of the bowlers with four for 46, while Wayne Parnell and Ed Barnard picked up two and three wickets respectively. Leicestershire’s batting effort in the second essay was quite similar to their first. Only Hasan Azad stood firm for the hosts as they lost four wickets to end the day on 132/4, still 119 behind making Worcestershire bat again on the final day. Brief Scores: Worcestershire 553/6 (Hamish Rutherford 123, Daryl Mitchell 114; Ben Mike 2-119) lead Leicestershire 302 (Ateeq Javed 69, Mark Cosgrove 67, Josh Tongue 4-46) & 132/4 f/o (Hasan Azad 54, Charlie Morris 3-15) by 119 runs. Riding on Haseeb Hameed and Rob Jones’s hundreds, Lancashire took control of proceedings against hosts Middlesex. Having already taken the lead yesterday, for the loss of four wickets, Lancashire saw Dane Vilas hit a patient fifty to extend their advantage. Tim Murtagh ended with five wickets to his name as Lancashire were bowled out for 427, that gave them a lead of 167. In reply, Mick Gubbins and Stephen Eskinazi lost their wickets early as Middlesex went to stumps at 68/2. Brief scores: Middlesex 265 and 68/2 trail Lancashire 427 (Haseeb Hameed 117, Rob Jones 122; Tim Murtagh 5 for 69) by 94 runs. Sussex inched towards victory against hosts Durham after a David Wiese (5-43) inspired bowling attack bundled them out for 189. Needing 212 to win, Sussex lost two early wickets, but Stiaan van Zyl and Luke Wells eased the nerves with an 83-run stand. Wells fell towards the end, but van Zyl staying unbeaten on 66 will give the visitors a lot of confidence as they go into the final day needing 68 more to win. Brief scores: Durham 224 & 189 (Gareth Harte 74, David Wiese 5-43) lead Sussex 202 & 144/3 (Stiaan van Zyl 66) by 68 runs.